We supply the UK's largest range of scales and weighing equipment. Free advice provided during normal office hours, Monday to Friday. All-purpose, electronic baby and infant scales with detachable tray for weighing in a supine or standing position. 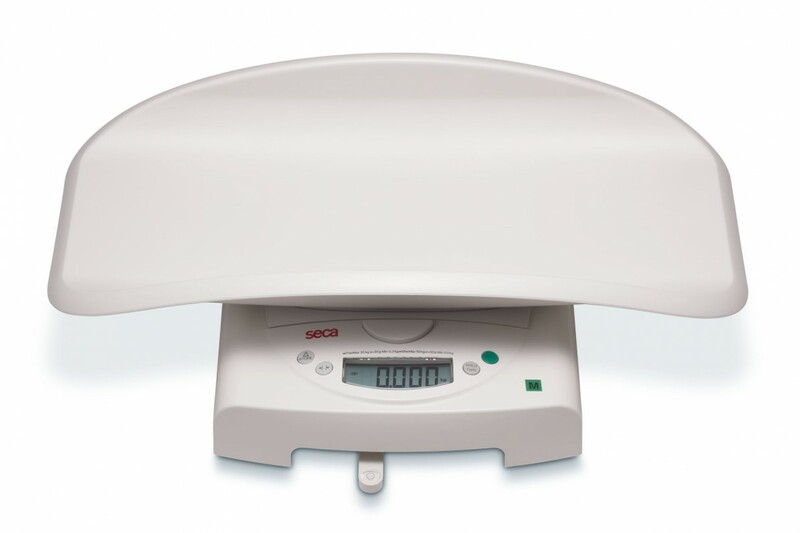 Two scales in one: the seca 384 baby scales with a comfortable weighing tray. In no time at all, it can be converted into a floor scale for children with a capacity of 20 kg. The weighing tray and the base which serves as the floor scale are securely locked together, thus ensuring that the baby can be weighed absolutely safely. However, at just the touch of a button, the tray can be detached from the base. A further advantage of the scale is its Breast-Milk-Intake function which determines how much milk the baby has taken consumed. The robust but lightweight scale is easy to transport; self-explanatory buttons make it easy to operate. Press the main image to view larger photos of the product. UK sales only accepted. All prices are subject to VAT and delivery charge. Please note that all prices exculde VAT, to be added at standard 20% rate. Our calibration services use weights certified by a UKAS accredited laboratory, traceable to National Standards. We offer the full scale repair and maintenance service in the Midlands, East Anglia and surrounding areas. Scaleways provide services to carry out scheduled checks and testing on your weighing equipment. Simply complete the form below as fully as possible about your enquiry and we will endeavour to call you back as soon as possible.